New members. Check in and say hello. Thread: New members. Check in and say hello. Hi everyone, I'm Garry, I live on the west coast of Scotland, 40 miles from Glasgow, i sold my Suzuki GSXR Srad 600 yesterday and have arranged to pick up a 2002 ZR7 S next weekend, its currently getting a engine fitted as the head was cracked on the original one, the bike had sat for a while, it will be mot'd this week and ready to go by Saturday. Welcome Garry, and to all the other new members. I think you'll enjoy the zr7s. Cracked head you say. hmm any idea how that happened? New Member Here, Just Checking In! 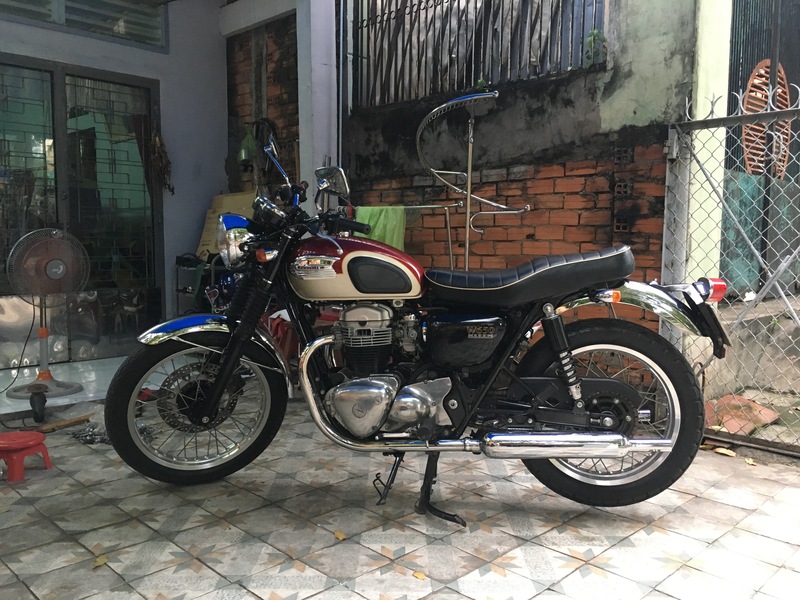 New member from Vietnam, where I just bought a 2005 red and silver W650 with a history of 25kkm and some abuse. I love it and I want to save it. Post some pics! Absolutely it's a must save future classic! No idea how to post pictures on this forum. Maybe an option will appear when I have posted a few messages? Modern W800 --could someone point me in the right direction? It's easy. Tap on the little square that looks like a picture of a tree. Then tap search files in your computer. Then upload and post. Double post? I can't seem to see my previous post. Here is my W just before I bought it. Was backfiring and rattling badly around 3krpm. Re-settled an exhaust pipe, checked and adjusted the bevel drive, which sings but in general looks good, and on my way I am. There is some knock on cylinder #2, a battered pipe on the side it was dropped, some goof changed the handrail to the wrong side so it now takes two to put it up on center stand, and _welded it_. To do: forks and shocks, maybe upgrade the front brake caliper. All in all a sweetheart. > any user with a W650 or W400? Is there a Forum here about the W? Hi, just checking in, I’ve recently bought a used Z750s and i’m Really looking forward to seeing other people’s mods and making my own mods to suit me and my riding style. Love the look of the bike and almost everything else about it but find one or two things a little irritating seat and the mirrors. Great all round bike though and looking forward out some (more) miles on her. Hi recently got a GSX1250FA 2016 , a change from Intruder / Boulevard I had , found myself wanting to long ride touring so wanted a bike with full panniers and a bit more spirited ride , live NW England . Hello my name is Hristo and i am from Bulgaria. I am driving a Piaggio Quartz 50cc for over 10 years. Now as i am getting my license to drive a 600 + motorcycle i am looking forward to buy a motorycle. I am thinking between Kawasaki z750/ 750S , Honda Hornet 600, Suzuki Gsxr 600 all 2004 year or newer. New member just checking in from Phoenix. Just got a 2018 Ninja 1000 ABS. I've had a BMW boxer and still have a Honda V4, this is my first inline 4. Looking forward to putting on many miles. Who says I must have a number plate on my bike? What?! Don't you like my flashing red and blue lights too?!! !